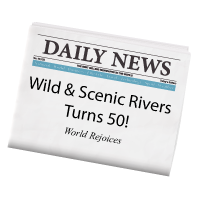 In 2018, the Wild and Scenic Rivers Act celebrated it's 50th anniversary. Events took place across the country and media attention focused on river activism. This page provides archival access to online resources from the anniversary, which may still have value into the future. Read the Wild and Scenic Rivers 50th Anniversary Success Report for a summary of successes, or watch the video below. 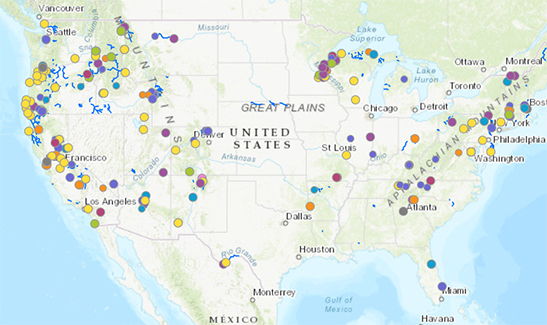 Overall, 250 river events took place in 164 different cities in 36 states. These events involved 191 community partners and 56 agency offices and collectively engaged more than 82,000 people. View a map of all rivers events. The following types of events were planned during 2018. Engaging artists and musicians of diverse mediums encouraged new perspectives on rivers and river values. Artist in Residence programs provided performances, displays, readings, artist talks, and community panel discussions. Arts events helped bridge gaps of awareness between rivers and modern society. The following links provide examples of events, residency programs, and environmental artists. You may also contact Wilderness Composer and Art Residency Consultant Stephen Wood. The Middle Fork of the Salmon River and the Selway River produced commemorative boat tag templates for 2018 that featured the anniversary logo. These displays—featuring rivers, trails and co-branded anniversary messaging—were produced by the Bureau of Land Management and manufactured by the San Diego Sign Company. Rivers offer a great opportunity for environmental education for both kids and adults! Water quality, fishing, and recreation can all be captured in outdoor, field-based lessons. A rivers reading list, as well as river-focused environmental education ideas were used and shared during the anniversary. Jr. Ranger Wild and Scenic Rivers Flyer - This resources is an activity flyer, in english and spanish, for kids. Middle School Wild and Scenic Rivers Curriculum - This river-focused teaching guide, created by the BLM, helps students find wild and scenic rivers, explore the history of the passage of the 1968 Wild and Scenic Rivers Act, and develop their own river-inspired poetry. U.S. Geological Survey water activity center - This site has questionnaires, opinions, student challenges, and even surveys in the Activity Center for many activities to help your students learn about water. U.S. Geological Survey's water science - This site offers many aspects of water, along with pictures, data, maps, interactive center and test your water knowledge. The U.S. Geological Survey recently released a new resource about the water cycle, aimed at schools and students. This interactive module, which can also be found in image format, shows the various stages, actors, and components of the cycle in three different versions for various ages and a variety of languages. The Water Sourcebooks contain 324 activities for grades K-12 divided into four sections: K-2, 3-5, 5-8, and 9-12. Each section is divided into five chapters: Introduction to Water, Drinking Water and Wastewater Treatment, Surface Water Resources, Ground Water Resources, and Wetlands and Coastal Waters. The US EPA Office of Water's site takes a look at how water quality is measured, what toxins are found in drinking water, and wetlands and groundwater. Highlights include a "What you can do?" section and suggested science projects. The Forest Service River Snorkling Program, offered in select areas, takes school children on river snorkling field trips and is accompanied by two videos and curriculum resources. The Wild & Scenic Film Festival created two one-night turnkey festival packages of river-specific films for 2018 at a discounted rate. The Wild Rivers on-tour program included 10 films and the Our Waters on-tour program included 11 films. Individual short feature films produced for the anniversary continue to be available online. Leave No Trace (LNT) was a natural fit with the 50th anniversary of the Wild and Scenic Rivers Act. 25,000 river Leave No Trace hangtags were produced by the Forest Service and distributed to the public at local events. Museums, airports, and visitor centers are high-traffic areas that were used to present educational exhibits about rivers. This exhibit request template was available to approach area museums, airports, or visitor centers about securing exhibit space in 2018. Play rivers-themed music using this Spotify rivers anniversary playlist. Merchandising relationships with Eagle River Designs, Rocky Mountain Promotional Products and Apparel, Top of the World, Loksak, Klean Kanteen, CafePress, Fox 40 and the River Management Society allowed individual and bulk purchasing of 14 different logo-themed products including pins, magnets, paddle medallions, stickers, temporary tattoos, patches, hats, t-shirts, socks, beverage cozies, water bottles, cell phone dry sacks, safety whistles and rivers booklets. In total, nearly 36,000 products were sold generating $48,000 in sales. Companies donating a percentage of proceeds from the sales of these items contributed, in total, over $7,000 to support the anniversary. River cleanups represented nearly 10% of events hosted in 2018. American Rivers continues to provide a framework for river cleanups. In late 2018, the United States Postal Service issues Forever Wild and Scenic Rivers stamps, available for purchase in 2019. River and water trivia were used as bar trivia, Jeopardy and as autoplay PowerPoint presentations shown before events. Volunteers helped add capacity to anniversary events and stewardship/advocacy activities. This volunteer resources package was developed to better engage volunteers around the anniversary. Volunteers were recognized with the 50 Hours for 50 Years Certificate. During National Public Lands Day 2018, sites were encouraged to focus on rivers and trails. 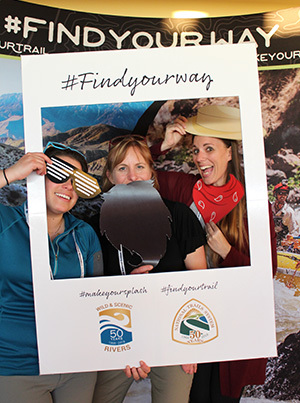 Ultimately, 683 miles of trails and rivers were maintained through National Public Lands Day 2018 volunteer events. American Rivers, American Whitewater and partners launched the 5,000 Miles of Wild campaign in 2018 to protected more rivers. The campaign runs through 2020 and you can participate by sharing your unique personal river story online. ESRI Storymaps make telling the story of an anniversary event or river easy. These storymap creation instructions give detailed guidance on the preparatory and technological steps involved in creating a compelling, interactive storymap. The anniversary online MEDIA KIT and Spanish Media Kit remain online through mid-2019 for interview ideas, interview questions, stories ideas, photos and more. What is a Wild and Scenic River? Rivers.gov is a definitive resource for the system, its history, management and designated river attributes. National River Storymap is an online ESRI storymap showcasing western, central and eastern rivers. NationalRiversProject.com is a searchable resource to find floatable Wild & Scenic Rivers, water trails, and whitewater and shows managing agency, permits required, camping and other amenities, nearby rivers and their difficulty. Tagline: It's your river. Make your splash! Multiple anniversary videos were created by agency offices and non-profit partners and continue to be available online. A special 50th anniversary logo (Spanish version) was designed for use during 2017 and 2018. This zip file contains logo files in different formats and a logo use guide. Although not comprehensive, this growing river quotations list includes quotations from a variety of authors, conservationists, legislators etc. Webinars offered during 2018 through River Network explored event planning and community building strategies. Watch the recordings below. While various proposals for additional Wild and Scenic Rivers designation continue to be considered by Congress, state resolutions during 2018 provided an important way to engage local and state government. An Introduction to Wild & Scenic Rivers - A concise primer on Wild & Scenic Rivers and what designation means to you. A Compendium of Questions & Answers Relating to Wild & Scenic Rivers - Everything you wanted to know about Wild & Scenic Rivers in a Q&A format. These Q&As can also be accessed through a searchable data base.